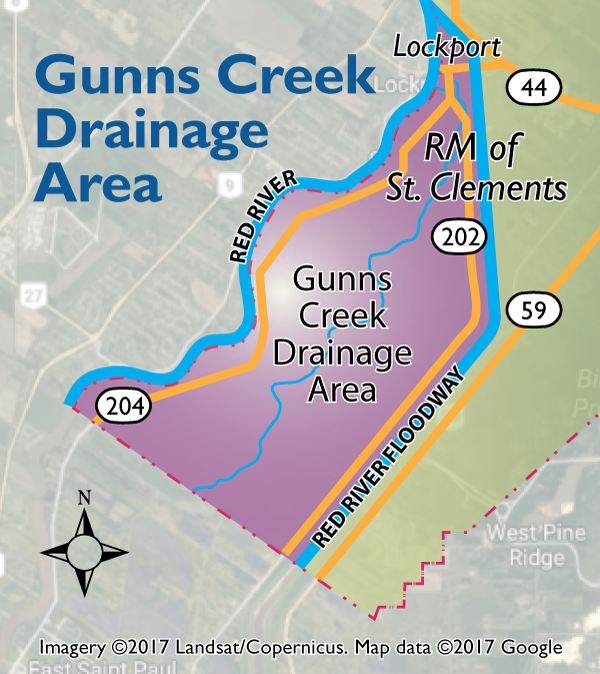 Based on drainage data gathered over the past few years by surveying areas with overland flooding issues, five problem areas have emerged: Gunns Creek, Bunns Creek, Ashfield, Grand Marais and Devils Creek. In 2018, the RM will start fixing trouble spots, continue to gather data, and work toward a long term sustainable water management plan to prevent future overland flooding. Council is considering borrowing money for this project. Increasing concern by residents about flooding around homes and farmer’s fields in the Gunns Creek and Bunns Creek areas caused the RM to look at how to fix these problems. In 2016, the RM conducted a drainage study in these areas. The engineer’s report suggests options for improving water flow and decreasing flooding, including cleaning drains (ditches), enlarging drains, and enlarging culverts. Download Bunns Creek and Tributary Drains – Drain and Crossing Upgrades Hydrologic and Hydraulic Assessment here. 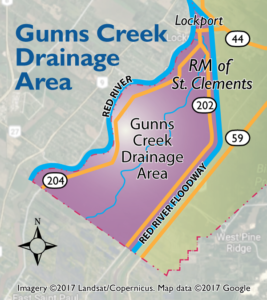 Download Gunns Creek Hydrologic and Hydraulic Assessment Drain and Crossing Upgrades here. The RM is asking the province to partner on some of these improvements and has applied for grants. Council is also considering borrowing money to do some of the work. The RM is in the process of conducting drainage studies in the Ashfield Road/Floodway Drive area and in the area of Anderson and Donald Streets in Grand Marais. The RM is also investigating problem areas served by drains maintained by both the province and the RM, particularly in the central part of the RM east of Highway 59. Land drainage is a partnership between landowners, municipalities, Conservation Districts and the Province. Basic agricultural land drainage works in the province were completed in the early 1900’s, under the jurisdictions of various municipally-based entities known as Drainage Districts. In the 1930’s and 1940’s provisions were made for the maintenance of the drains through the establishment of Drainage Maintenance Districts, again established on municipal boundaries. In 1965 Manitoba took a proactive approach to resolving inter-municipal drainage issues by being the first of all surrounding jurisdictions to take on the responsibility for Provincial Waterways (the major drains) based on a watershed systems approach. In general, municipalities became responsible for those components of the tributary system which outlet into the Provincial Waterways. During the 1960’s and the period between the late 1970’s and the mid 1980’s, a number of cost sharing programs between federal, provincial and municipal jurisdictions resulted in significant temporary boosts to drainage system reconstruction and development. The dryer cycle in regional weather of the late 1980’s, resulted in drainage issues becoming less prominent. A commensurate loss of federal support saw provincial technical and financial resources dedicated to drainage significantly reduced. In 1989 the provincial government held a series of public consultations which resulted in the publication of Manitoba’s Water Policies. Drainage was raised as a significant issue. Drainage priorities were outlined as follows: maintenance of the existing system -first priority, reconstruction -second priority, and new construction -third priority. The policies further stated that drainage should be undertaken on a watershed basis in order to encompass issues related to water retention, control and timing of runoff. During the 1990’s, a wetter than normal cycle predominated, revealing the effects of the deteriorated drainage infrastructure across the province, i.e. attendant crop and other flooding related damages. The increased profile of drainage issues also highlighted regulatory shortcomings. The Province responded by transferring staff to regional postings so that drainage regulation could be administered at the local level. Enforcement of The Water Rights Act was actively pursued for the first time. The result of these changes was quicker action on enforcement and a shorter turn around time on licensing. There was also a significant increase in drainage license applications.